All of the world is undergoing a digital transformation. 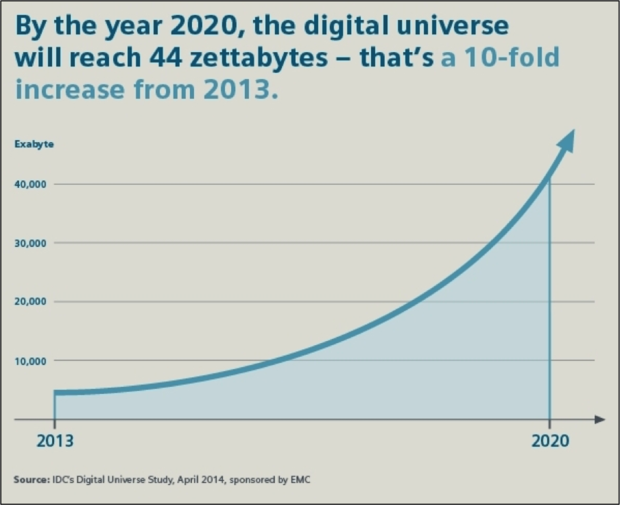 By 2020, the digital universe will reach 44 zettabytes – that’s a 10-fold increase from 2013. 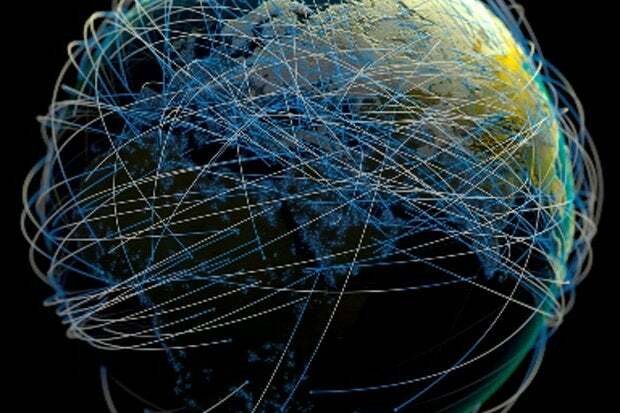 The world is undergoing a digital transformation. For example, there will soon be over a billion smartphones, impacting all aspects of organizations’ value chains, commerce, and customer and supplier engagement processes. This transformation will result in an explosion in digital data (see Figure 1), and more importantly, usable insight. And the smartphone isn’t the only digital technology driving business transformation. Other technologies like sensors, beacons, scanners, RFID (radio frequency identification), NFC (near field communications), GPS (global positioning systems), Bluetooth, web clicks, social media postings, digital newsfeeds, smart watches, fitness bands, video surveillance, drones, robotics, etc. are all contributing to the digitalization of our physical world (see Figure 2). However, in spite of all the advances in virtual and augmented reality, the physical world is not going away. We will still need to live in homes, wear clothes, eat food, wash dishes, paint bathrooms, ride in vehicles, fly in airplanes, go to movies and malls, exercise, sleep, etc. And companies are still going to manufacture products and provide services to support the wide variety of physical needs. Companies are still going to need a value creation process (or value chain), which are the activities an organization performs to add value to a product or service, including design, procurement, production, logistics, marketing, sales and service. 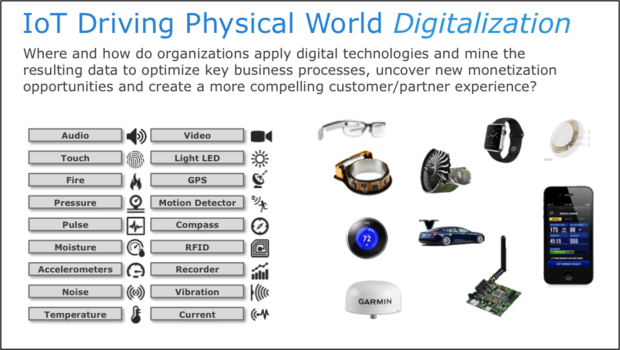 Digitalization transformation will not replace the physical world; it will augment it. Likewise, digital transformation will not replace an organization’s value creation processes; it will augment it! Digital transformation extends and expands the opportunities for organizations to create additional and new customer, product and market value. So the key question for organizations contemplating this digital transformation is where and how can the organization exploit these digital technologies in a way that augments or expands their business models; that is, where and how do organizations apply digital technologies and the resulting data to optimize key business processes, uncover new monetization opportunities and create a more compelling customer experience? The purpose of this blog is to provide a framework to answer that question for your organization. As I discussed in my blog “Determining the Economic Value of Data”, data as well as these other digital assets exhibit an unusual currency behavior; that unlike money or human currency, digital currencies are not constrained by transactional limitations. In fact, data currency exhibits a network effect, where data can be used simultaneously time across multiple use cases thereby increasing its value to the organization. This makes data a powerful currency in which to invest. The most common sources of financial value from the digitalization of the business resides in the “save money” aspect of the digital business transformation. This is where organizations are installing digital technologies to take out costs within their key business processes (e.g., order entry, procurement, development, manufacturing, logistics, marketing, sales, support, finance). For example, retailers realized substantial cost savings by having customers directly enter their orders (via websites or mobile apps), which is more efficient then hiring store employees or call center representatives to take those orders? The Return on Investment (ROI) for these types of projects typically reside in the 10% to 20% cost savings range. Very nice, but not game changing. 1. Optimize key value chain processes. Exploit superior customer, product and operational insights to not just improve existing business processes but to actually change or re-tool the entire process. 2. Uncover new monetization opportunities. Leverage superior customer, product and operational insights to identify “white spaces” or under-served, un-served or un-met market that yield new monetization opportunities (e.g., new products, new services, new partners, new channels). 3. Create a more compelling, more prescriptive customer experience. Leverage an understanding of an individual customer’s tendencies, preferences, behaviors, propensities, trends, interests, passions, associations and affiliations to provide a more rewarding customer and partner experience. With those three perspectives in mind, we now have a “frame” against which we can make technology and business decisions about the application of digital technologies and the potential financial return. 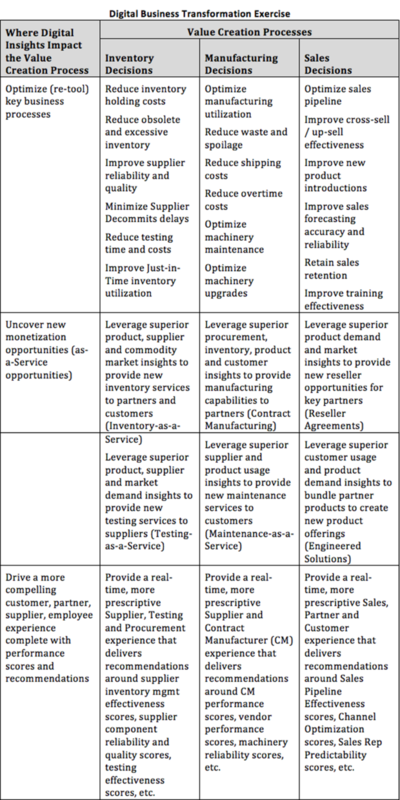 This simple structure, as exhibited in Table 1, asks these three questions of each of the stages of an organization’s value creation processes (see my blog “Big Data MBA: Course 101A – Unit III” for a quick review of Michael Porter’s Value Chain Analysis process). For reasons due to lack of space, I have tested this approach against three business functions – Inventory Management, Manufacturing, and Sales (see Table 1). Yes, addressing these three questions helps to provide the foundation for determining where and how to exploit digital technologies and the resulting data exhaust to drive digital business transformation; to not just “save money” through the installation of digital technologies, but to actually “make money” through the exploitation of the resulting data and superior customer, product and operational insights. Bottom-line: Digital business transformation is about integrating the growing body of digital technologies and the resulting customer, product and operational data (insights) into your organizations physical value creation capabilities to yield new sources of intellectual capital (data and analytics), competitive differentiation and customer insight. Sounds like a worthwhile goal. Sometimes what’s old is new again. Michael Porter’s Value Chain Analysis is as relevant now as it was when he introduced the concept in his book "Competitive Advantage: Creating and Sustaining Superior Performance" back in 1985 (yea, fax machines and laser disk players were also big back then). 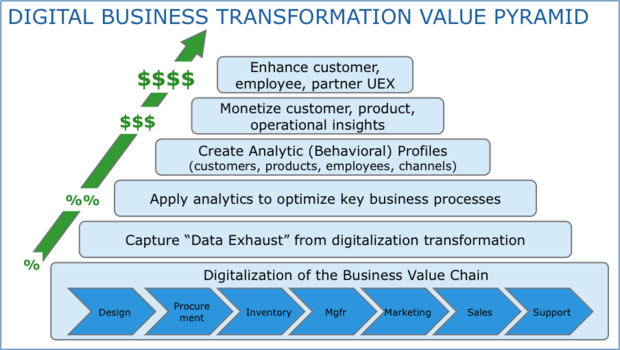 However, let’s build upon the traditional value chain analysis to highlight the new sources of economic value and digital intellectual capital that can be realized from the organization’s digital business transformation process (see Figure 3). Want to know how to turn “Digital Business Transformation” from yet another industry buzzword into competitive differentiation? Then look to couple the data insights from the installation of digital technologies (e.g., smartphones, sensors, beacons, scanners, RFID, GPS, Bluetooth, web clicks, smart watches, fitness bands, video surveillance, drones, robotics) with data science to uncover superior customer, product and operational insights. Then aggressively move up the “Digital Business Transformation Value Pyramid” to leverage these superior insights to optimize (re-tool) key business processes, uncover new monetization opportunities (new products, services, channels, markets, partners) and create a more compelling, more prescriptive customer, partner and employee user experience. For more information about how we at Dell EMC Services approach these game-changing opportunities, check out my blog “KPMG Survey: Firms Struggle with Big Data.” It’s one of my favorites!